Notes regarding 3D video playback support in WS.WebTV. WS.WebTV 2.1+ for 3D video playback support on HTML5. Although 3D video playback has been supported in the Flash video player since WS.WebTV 1, since WS.WebTV 2.1 we have added support for 3D video playback in the HTML5 video player too. Below you will find important information regarding the implementation of this technology in WS.WebTV. The server that hosts the files must have a crossdomain.xml file (http://www.adobe.com/devnet/adobe-media-server/articles/cross-domain-xml-for-streaming.html) allowing the domain of the WebTV. The resources must be delivered with CORS headers (https://developer.mozilla.org/en-US/docs/Web/HTTP/Access_control_CORS) permitting GET requests. Any browser with Flash plugin. The feature will work better in Chrome, Safari and Firefox. Note regarding Internet Explorer and Edge browsers: If the domain of the video files does not match the domain of the WebTV, the 3D Stereo video modes option won't be available in IE/Edge; this is due to a CORS issue in IE/Edge. 3D Stereo Modes require powerful hardware, specially on HTML5; therefore, the playback may be "jerky" on slow devices. Some WS.WebTV features/extensions (like PlayerLogo, ClipInteractivity and Subtitles) may not work fine when using the side-by-side stereo modes. 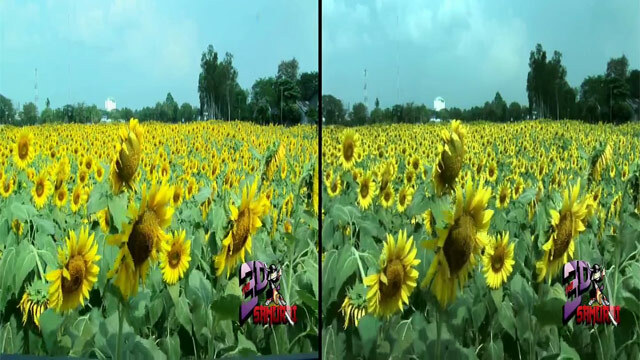 Credits: Sample 3D image taken from 3D Samurai (3DGuy), Sunflower Field video (http://3dguy.tv/).